This is one of the most frequently asked questions and the answer is yes. Although it is a relatively simple question, with a simple answer, there are many aspects of a new patient appointment that you may not know. For the residents of Sidney, a new patient appointment is an important step in developing a trusting relationship with your oral health care providers and establishing your dental home. Yes, there will be some paperwork to complete, but this information is necessary to provide you with the best care. Most patients will see their oral health care provider two times per year, but will only see their medical doctor if they are sick. This means your dentist has the ability to screen for subtle changes in your overall health. The visit begins with series of questions pertaining to your previous dental care. It is important for you to freely communicate any past experiences that may have been unpleasant or uncomfortable for you, as well as express your primary reason for seeking dental care. Your dentist wants to understand what is important to you, while helping you achieve optimum oral health. Dental x-rays will be taken as part of your comprehensive exam. Modern digital x-rays require very little radiation exposure and are instantly displayed on a computer screen. These x-rays allow the dentist to see below the gums as well as the areas between the teeth, and are a critical diagnostic tool to detect cavities or an abscess. Measurements of the gums will be taken. Larger numbers are an indication of an infection that can be treated. Active gum disease has been linked to diabetes, pneumonia, high blood pressures, pre-mature and low birth weight babies, tooth loss and even Alzheimer’s disease. 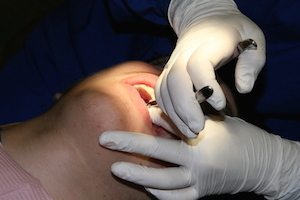 Your oral health care provider will then perform an oral cancer screening. This is a non-invasive exam using an instrument called a “Velscope”, which can detect tissue lesions that may require further testing. The Velscope exam is an excellent visual tool, however a manual exam of the head, neck and throat is performed to detect any lumps or bumps that may be present. Early detection is critical in the treatment of oral cancer. All previous dental restorations (fillings), including crowns, bridges, missing teeth or implants are recorded as part of your dental record. Healthy patients can be scheduled for their routine dental cleaning. Patients with gum disease will receive a treatment plan to address their specific condition. As you can see, so much information is gathered and recorded at your new patient visit and will become an important part of your health file. Visiting with a new dentist is an opportunity to have a comprehensive look at your total health and is a time for you to establish a trusting relationship with your new oral health care provider. A healthy mouth is part of a healthy body. For information like this and more, follow us on Twitter and like us on Facebook!